If your adventurous spirit has you traveling to the four corners of the earth, then you’d better be prepared. Not having the right gear can weigh you down and interfere with precious moments. One of a serious traveler’s most prized possessions, the sling bag, proves to be an essential sidekick to take with you on your journey. We made it our duty to find the very best sling bags for travel. However, you may be feeling stumped trying to find the sling bag that’s most suitable for your needs. It’s understandable because there are a lot of bags on the market. That’s why we’re here to educate you on a few of the best sling bags for travel. With the help of Travel Freedom, you can get back to doing what you love. Before you run out and buy just any old bag, first consider what you need. If you’re the stylish type, you may be willing to sacrifice weather resistance for a design that stands out. Like most of us, your cargo will probably include some high-tech electronics. For this reason, you may want to set your priority on buying a sling bag with compartments that hold laptops, cameras, tripods and so on. 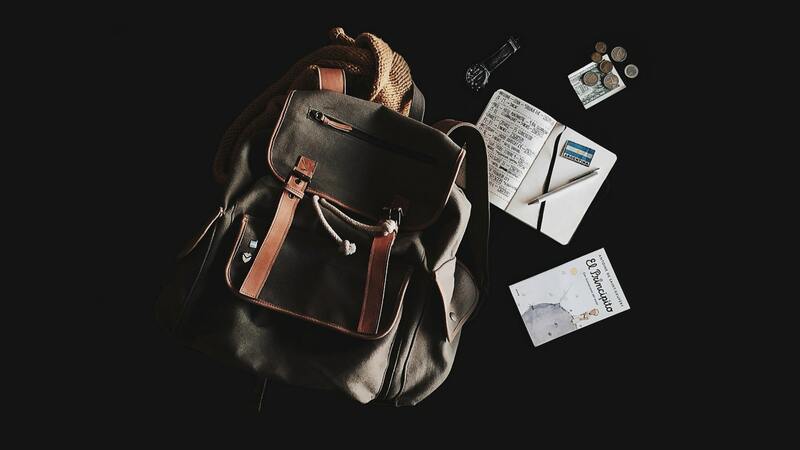 Whatever your needs, it’s important to peruse some of the best sling bags for travel to find that one that’s right for you. 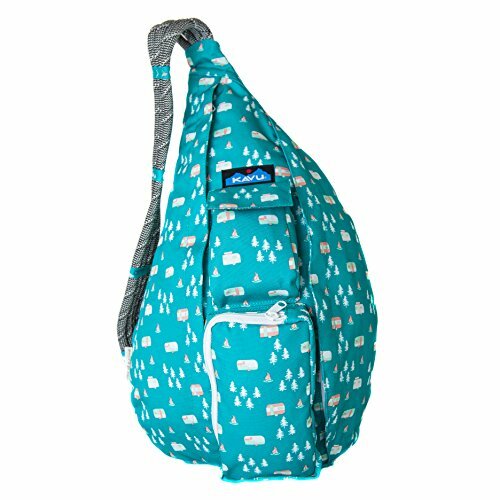 KAVU Rope Sling Bag Price: $44.00 With plenty of great design options to choose from, you can't go wrong with this bag made in Seattle. KAVU is a company built on the philosophy of adventure seeking and provides travelers with the goods they’ll need for the next escapade. The KAVU rope sling bag is both stylish, ergonomic and able to hold many of your travel items. The material options include comfortable cotton canvas, polyester, and water-resistant polyester as well. No matter which material you choose, you’ll quickly appreciate the ergonomics. The teardrop design rests cozily on your back and an adjustable wrap contours the shoulders. Furthermore, it’s surprisingly spacious and has three exterior pockets. 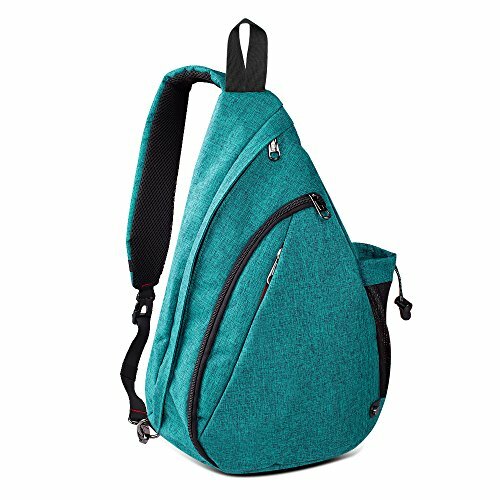 What makes this bag stand out at first sight among the best travel sling bags would be the colorful designs, all 42 of them. There should be little worry about finding the best color and pattern to fit your personality. From dark colors like black oak and dark forest to the bright saffron, KAVU fits right in with adventure. OutdoorMaster Sling Bag Price: $19.99 This compact, yet spacious sling bag for men or women is perfect for travel. This bag lets you carry along all your travel necessities with a lightweight design. With 12 liters of volume, it’s like your sling bag is barely there. Avoid feeling weighed down on your hike, trip to the mall and beyond. To top it off, the nylon bag is foldable, making your packing incredibly easy. It will fit nicely into a suitcase or purse until you’re ready to use it. You also get to choose from a variety of colors, adding some glamour to your escapades. A final perk is that among the best sling bags for travel, this one is the most affordable. Lastly, there’s an anti-theft section where you can safely secure your valuables, such as your wallet and phone. 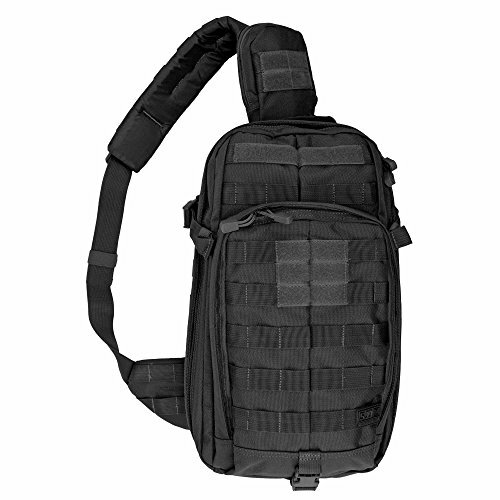 5.11 RUSH MOAB 10 Tactical Sling Bag Price: $79.99 With pockets for everything, this tactical sling bag is perfect for strenuous or off-grid trekking. The Rush MOAB (Mobile Operation Attachment Bag) series bags take packing seriously and aren’t for the faint of heart. Rush MOAB 10 is suitable for military officials and ideal for travelers and outdoorsy types. The many outstanding features below earn it a top spot on the list of the best sling bags for travel. This bag has a plethora of pockets, so many that we can’t imagine you’ll ever run out of space for your tools and trinkets. The material consists of 1050D nylon. Additionally, there’s tacky rubber to keep the bag in place while you’re wearing it. There are also Velcro strips attached to the back for nameplates, making sure your possessions aren’t lost in a mix-up. Added perks you might not want to pass up are the scratch-free sunglasses pouch, easy grip handle and built-in hydration valve. It’s also easy to reposition, so you can wear it on your side or in front of you for easy access. These features are ideal for hikers and climbers. Furthermore, the weapon pocket may be handy for scaring off those mountain lions. Even more, it’s one of the few bags available that’s made for both left and right-handed users. There are hidden straps on both sides, and you can choose to use the left or right one while the other stays tucked away. You may also find the extra strap, padding, and ventilation quite useful for the rugged outdoors. The bag is only available in sandstone and black, but the comfort and safety features available clearly outweigh the need for style. Mygreen Canvas Sling Bag Price: $26.99 This fashionable canvas sling bag is perfect for carrying a small laptop. This vintage messenger bag is both stylish and convenient, making it just as fitting for a camping trip as it is for a trip to the mall. It has durable canvas and leather on the outside and soft, luxurious material on the inside. Style-conscious users will also appreciate the color varieties, along with the leather and metal accents. Though it’s not huge in size, it’s nonetheless quite spacious. The bag’s main compartment can hold items such as a 13-inch laptop, a mobile phone, snacks, wallets and much more. Customers found this bag to be much more spacious than it looks. The magnetic pocket makes securing your items super easy and the mesh pocket with an elastic band secure your water bottles with ease. Furthermore, one feature that sets it apart among the best travel sling bags is it’s suited for both lefties and righties. Altura Photo Camera Sling Bag Price: $32.99 Made to carry DSLR and Mirrorless cameras, this bag is perfect for the photographer in you. What’s traveling without captured memories? If it’s important for you to document your travel experiences with a camera, then you need a safe way to carry and protect your tools. The main compartment is equipped with padded dividers to hold your standard zoom lens camera. 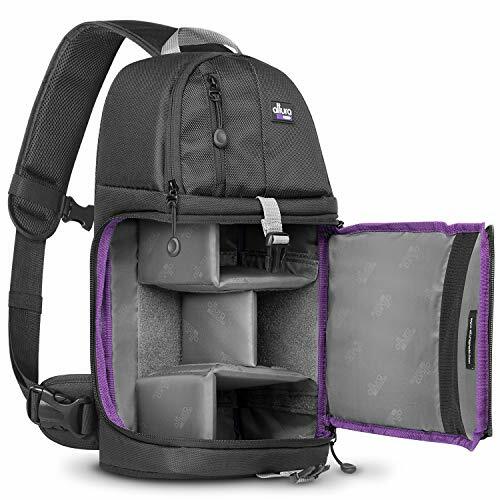 The top compartment fits flash tools, extra lenses, and other accessories. There’s even an external tripod holder. The padded sling adds comfort and rotates for easy front access to your bag. Mesh and zipper pockets also add comfort and protect your camera’s parts. Among the best sling bags for travel, this one is guaranteed to catch the photographer’s eye. There’s not much room for more than camera equipment. When considering the best sling bags for travel, there are a few attributes to think about. 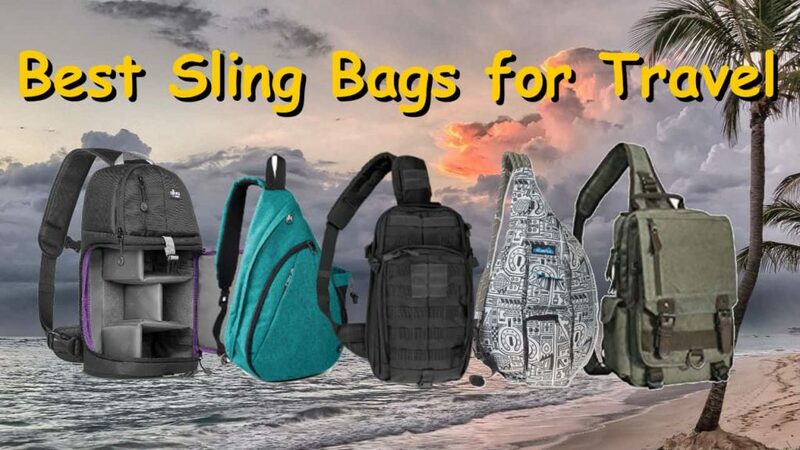 Some of those considerations include whether to use a sling or a backpack, tips for getting the best out of your sling bag and features to look out for in a sling bag. Backpacks are two-strap bags that are generally bulkier than sling bags, which have only one strap. The single strap makes sling bags easy to carry and shift position, making them popular among travelers. Sling bags are easy to carry have fewer straps and generally weigh less. However, the bulkiness and larger number of straps you’ll find on a backpack help to evenly distribute weight. This leads to less stress on the back. So, while sling bags are light, stylish and easy to transport, they could be the culprit for lower back pain. Studies have found the correlation between sling bags, backpacks and back pain. Because of stress on muscles like the trapezius, lats, and spine, experts recommend two-strap bags for long-term use. Adjust the weight from one side to the other periodically or remove the bag periodically to avoid asymmetrical stress on the back and shoulders. Aim for thicker straps to prevent straps from cutting into your shoulder muscles. Try not to carry more than 10 percent of your body weight. Choose a smaller bag because the smaller the bag, the less likely you are to pack it with heavy items. Remove your bag from time to time or substitute with a backpack. Features such as design, size, comfort, and materials can make the difference between a bag you pack for every trip and one you give away. Considering each feature will ensure you’re getting what you need in a bag as an individual, not the status quo. Because sling bags have a tendency to shift weight unevenly, it’s important to find one that’s as comfortable as possible. Also, because we tend to wear them for hours at a time, the best travel sling bags are equipped with thick straps, padding, and an ergonomic design. Don’t let style or necessity distract you from choosing a bag that’s comfortable. Among the best sling bags for travel are those that are designed to carry your favorite items with comfort. They are a combination of lightweight, comfort and durability and a built with enough space for your favorite cargo. The best travel sling bags are compact and are easy to transport. For instance, they’re usually considered acceptable to take on board an airplane. Even so, sizes vary. Some can fit laptops, for instance, while others are just suitable for small items like phones, water bottles, and wallets. Be sure that you choose a size that’s bigger than you actually think you’ll need, just in case. Among the best sling bags for travel are those that are both affordable and expensive. The good news is that there’s no need to go beyond your means. 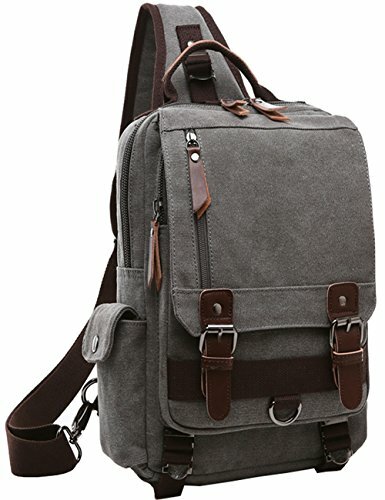 There are plenty of affordable and high-quality sling bags out there. Don’t assume a high price equates to quality. Sling bags are usually available in canvas, polyester, nylon, and leather. If you’re looking for a bag to take to school or on a shopping spree, then material materials may not be much of an issue. However, if you’re made for the outdoors, then a material like water-resistant nylon may be more suitable. Be sure to choose a material to fit the environment you anticipate to avoid damaging your bag and your goods. Which Sling Bag Would we Choose? If we had to choose one from the list of best sling bags for travel, we’d recommend the Tactical Rush MOAB. It’s almost impossible to find yourself lacking space for your travel items. Furthermore, it’s got a comfortable design and durability for harsh weather conditions and getting down and dirty. However, if the price doesn’t sit well with you, we’d recommend the MyGreen Canvas sling bag. Like the MOAB, it’s made for both lefties and rights and has multiple compartments. It also has space for laptop transport, a feature not popular among the best sling bags for travel. The Chase Freedom vs Freedom Unlimited debate is a simple one to tackle. Both credit cards are very similar, besides one important factor. 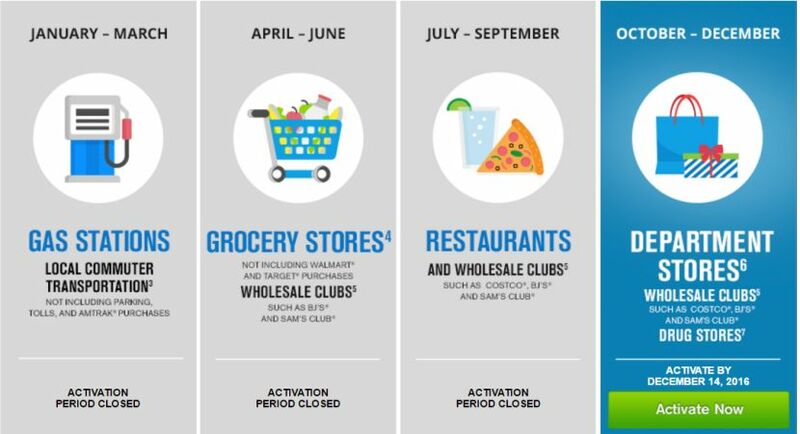 How they earn Chase Ultimate Rewards points. They even have such a similar card name that people often confuse which card is which. The Chase Freedom credit card is the original card which offers bonus categories that earn 5 points per $1 spent that rotate quarterly. The Chase Freedom Unlimited credit card is the successor which offers a consistent 1.5 points per $1 spent on all purchases. 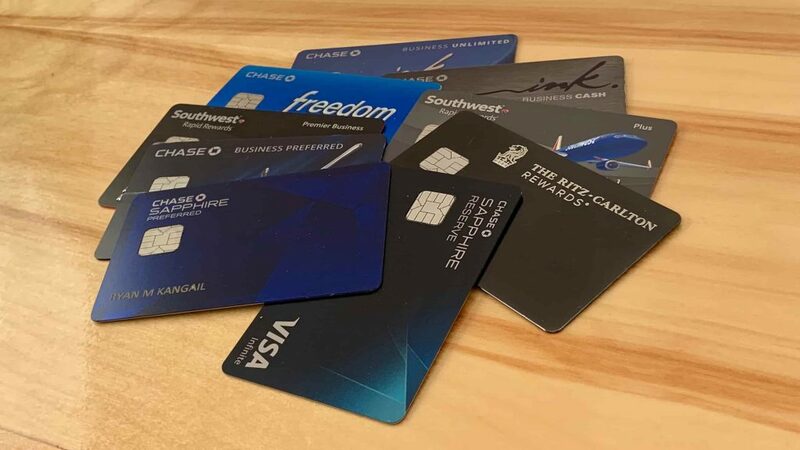 The debate of frequent travelers and credit card experts is over which card is better for earning Chase Ultimate Rewards points. $150 (15k Ultimate Rewards) after spending $500 in 3 mo. While both cards used to come with an introductory offer of $150, now only the Chase Freedom card offers that. The Freedom Unlimited has a new offer. In the first year of being a cardmember, you’ll earn 3% on all purchases up to $20,000 in spend. 3% is double the usual rewards and can earn you up to 60,000 bonus Chase Ultimate Rewards points in the first year. That would be 30,000 more than you’d earn regularly at 1.5%. Is it a good offer? I’ll leave that for you to decide. Note that both cards have a 3% foreign transaction fee, so they aren’t the best cards to use while traveling internationally. They both also get approvals with credit scores in the range of good to great (670+). If your credit score is not at this level yet, learn about the credit cards available to those with fair credit. The one difference these two credit cards have is how points are earned. The Chase Freedom earns 5 points per $1 spent on rotating categories, like gas stations, grocery stores, restaurants, department stores, phone bills, or cable bills. They also have categories such as using Chase Pay or Apple Pay on your phone. Each quarter there will typically be 3 different categories that earn the 5X bonus. These category bonuses are limited to $1500 of spending each quarter. So, the maximum amount of points earned per quarter is 7,500. All other purchases will earn 1 point per $1 spent. The Chase Freedom Unlimited has no rotating categories, and simply earns 1.5 points on each and every purchase. It has no spending limit for its earning rate. The Chase Freedom Unlimited vs Freedom debate comes down to which of these two no-fee credit cards is best for you. Let’s compare the Chase Freedom vs Freedom Unlimited using the scenario of a person who spends $2,000 per month. 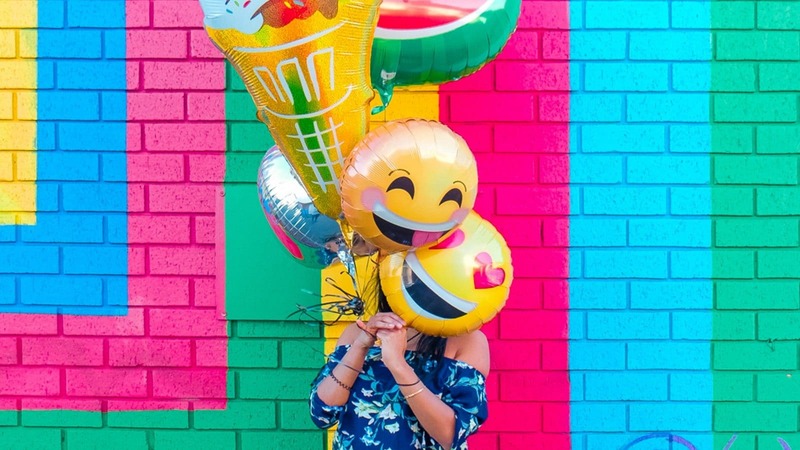 The Chase Freedom Unlimited is great for people who don’t want to worry about where and when they spend their money, but still want an elevated rate of earning points. By earning 1.5 points per $1 spent on all purchases, you can simply use the card and earn the same amount of points on everything. 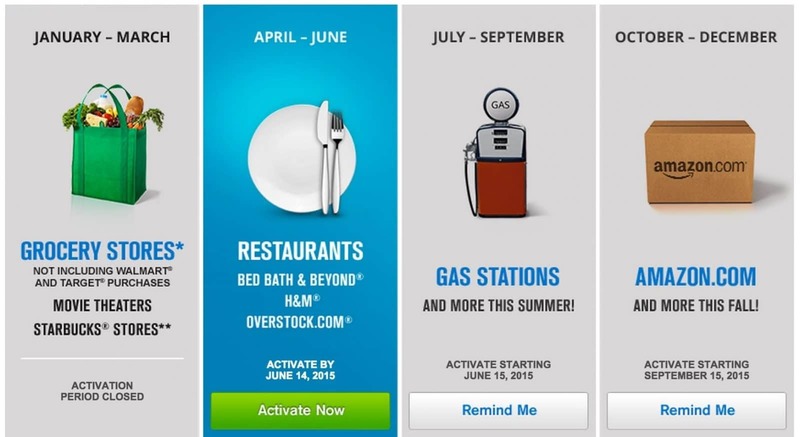 Never worry about going to a certain store or gas station, or activating any category bonuses. This card is for no-nonsense people who just want simplicity. If this is you, the Chase Freedom Unlimited would be a great addition to your wallet. The original Chase Freedom card is better for people who are looking to maximize their points earning with every purchase. Because Chase Freedom has very good category bonuses, it’s possible to get nearly the full amount of bonus points per quarter (7500). Many of the category bonus merchants even have gift card racks. Gift cards can be bought to make purchases at the stores you regularly go to. This technique can allow you to earn 5X points on nearly everything. Personally, if we could only have one of the two cards, we would choose the Freedom because we’re willing to put in the extra effort to maximize points. Chase Freedom vs Freedom Unlimited: How About Both? Why treat these cards like competitors when they can play together quite nicely? Like Kevin Durant and Stephen Curry playing together on the basketball court, these two credit cards can be champions together (NBA reference). If you pair the two credit cards, you can earn 5X points on all Chase Freedom category bonuses and 1.5X points on everything else using the Chase Freedom Unlimited. This will give you the best of both worlds and a killer point earning combination. Double the freedom has to be a good thing, right? Here’s a little secret that you’ll want to know if you have any Ultimate Rewards points. When Chase Ultimate Rewards are redeemed using either of the Freedom credit cards, points are worth 1 cent each. But, because Chase Ultimate Rewards points are transferable between different cards, and even between different people (only household members), point values can be multiplied. With a few of the other premium Chase credit cards, it’s possible to redeem points at a higher value. When redeemed through the Chase Ultimate Rewards travel portal, points are worth 1.25 cents with the Chase Sapphire Preferred or Chase Ink Preferred and 1.5 cents with the Chase Sapphire Reserve. All three of these credit cards also come with the ability to use Chase’s travel transfer partners. 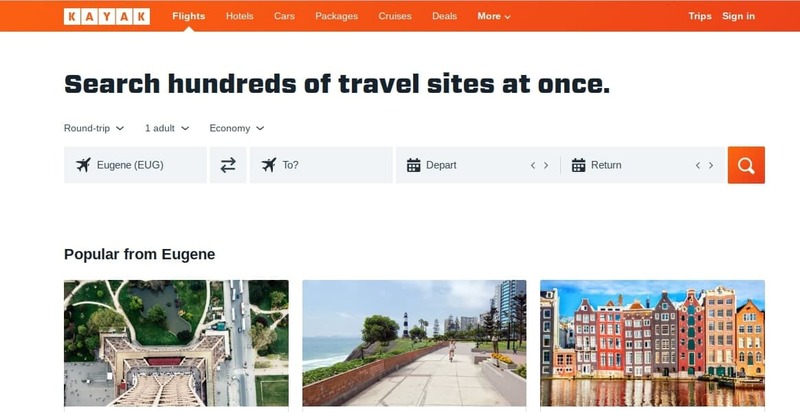 By transferring to some of their travel partners at a 1:1 ratio, it’s possible to redeem points for well over 2 cents each. 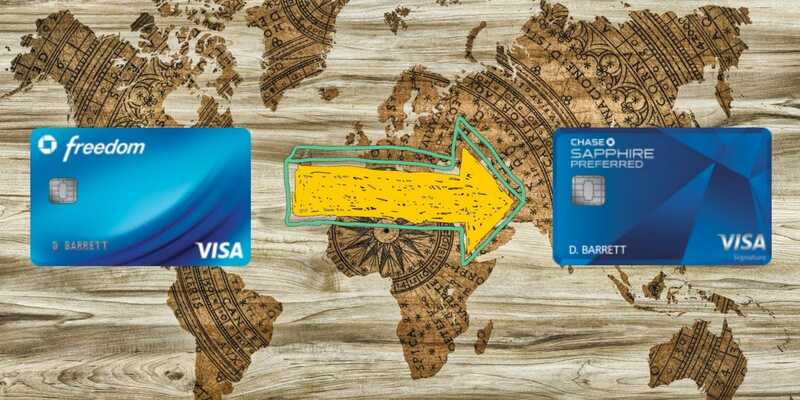 If you’re able to have one of these premium Chase credit cards to go along with your Freedom or Freedom Unlimited, it always makes sense to transfer points before redeeming. In order to be eligible for the Chase Freedom 5X quarterly bonus categories, you’ll need to activate your card each quarter. You’ll visit this Chase web-page and fill out your last name, last 4 digits of your card, your zip code, and press enter. That’s all. It’s very simple, and Chase will even send you reminders via email. 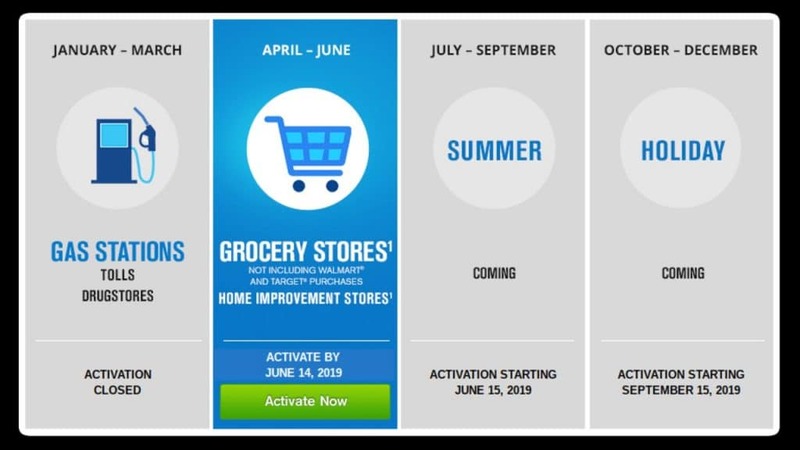 For your category bonuses to work, you’ll need to activate your Chase Freedom by the middle of the last month in that quarter. For instance, you must activate your card by December 14th, 2018 to be eligible for the quarter 4 bonuses in 2018. 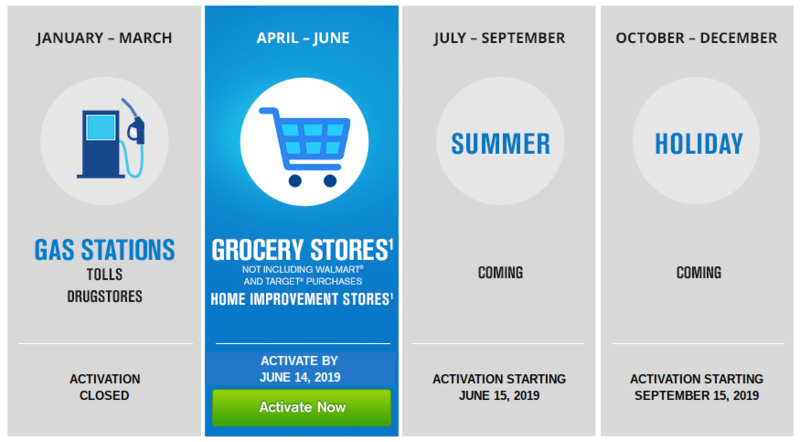 With Chase’s reminders and the fact that you’ll want to know what the bonus categories are, it’s easy to remember to activate your card. To see the current and upcoming Chase Freedom 5X bonus categories visit the Chase Freedom Calendar. You’ll also be able to activate your card on the same page. If you’re looking to add a great credit card for earning points by spending, either the Chase Freedom Unlimited or Freedom are great additions to any wallet. They are very similar cards with that one large difference. How points are earned through spending. Pick which card fits your style best, or even better, go with both. Definitely look into the other Chase Ultimate Rewards credit cards to partner with these so that you can both maximize your earning and your point redemptions. Just think, if you can earn 5X points on every $1 spent, and then redeem those points for a value of 2 cents or more, you’re essentially getting 10% or better back in value on your spending. That’s pretty impressive, compared to the typical 1% cash back earned with other cards. Are you looking for the current Chase Freedom Calendar? We have the current Chase Freedom rewards calendar as well as all the old calendars dating back to 2013. The Chase Freedom is a great credit card for earning Chase Ultimate Rewards points on purchases. It earns 5X points on quarterly rotating category bonuses. Over the years these bonuses have ranged from grocery stores to gas stations. From movie theaters to Amazon. And, from restaurants to warehouse stores. Did You Know: You Can Multiply the Value of Your Ultimate Rewards? Not everyone knows about it, but there’s a secret trick that can double the value of your Chase Ultimate Rewards. Chase Ultimate Rewards are worth just 1 cent each when redeemed using the Chase Freedom card. Even though Chase doesn’t announce it, your Ultimate Rewards points are transferable between different Chase card accounts. They’re even transferable between different peoples’ accounts (household members). This is important because, with some of the premium Chase credit cards, it’s possible to redeem points at a higher value. 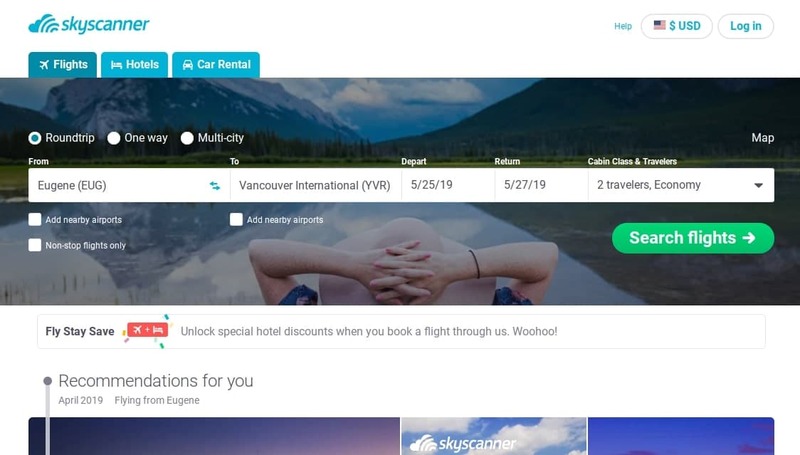 If you redeem Chase Ultimate Rewards through the travel portal. Only certain Chase credit cards have access to the travel portal though. The Chase Sapphire Preferred or Chase Ink Preferred offers 1.25 cents per points (25% more value) while the Chase Sapphire Reserve offers a whopping 1.5 cents per point (50% more value) by redeeming points through the travel portal! 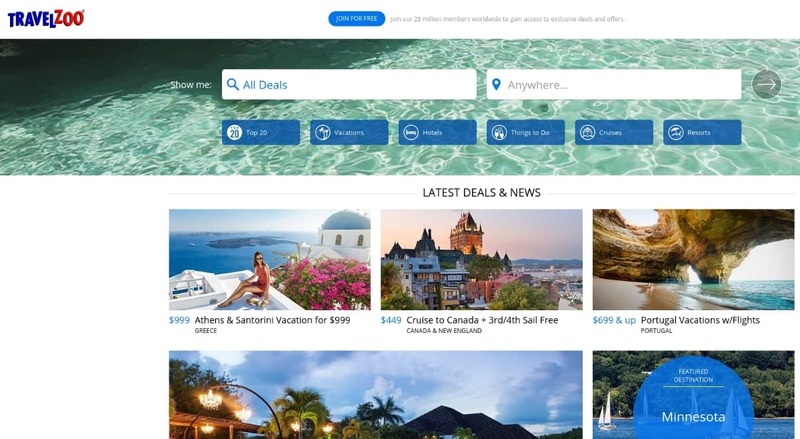 Chase Sapphire Preferred – 1.25 cents per point through the travel portal. 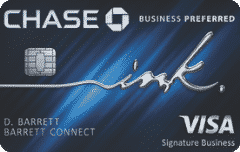 Ink Business Preferred – 1.25 cents per point through the travel portal. Chase Sapphire Reserve – 1.5 cents per point through the travel portal. All three of these credit cards also come with the ability to use Chase’s travel transfer partners. You can transfer Ultimate Rewards to these travel partners at a 1:1 ratio. By using your points with airlines or hotels it’s possible to redeem points for well over 2 cents each. Pairing these premium Chase credit cards with your Freedom card multiplies your redemption value by double more. If you’re interested, here’s what was offered in the past. The Chase Freedom calendar’s category bonuses have evolved over the years. For the most part, the offers have become better and better. 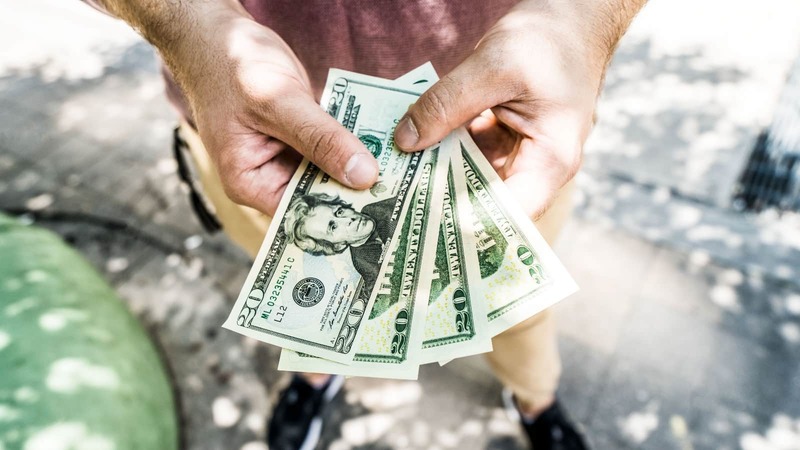 Having the Chase Freedom in your wallet has been quite the benefit over the past few years if you were able to maximize it’s category bonuses. Each year it’s possible to earn up to 30,000 points, which is more than enough to take a round-trip flight. 2018 was the year of Chase Pay as it was a bonus category three out of four quarters. 2013 brought us a selection of category bonuses, but some of them were difficult to maximize. As you can see, having a Chase Freedom credit card can pay off. Earning 5X points on many purchases can earn you a free round-trip flight each year or more. When you bundle your Freedom card with other premier Chase credit cards, you can redeem those points for even more. The Chase Ultimate Rewards system is the best in the market. The Chase Freedom is one of the easiest ways to earn Ultimate Rewards. If you don’t have one yet, you should think about adding it to your wallet. Finding the right business travel credit card to keep in your wallet can really improve your overall experience. When you have access to a good credit card, it becomes possible to earn rewards for your normal travel expenses. To add to this, you will be able to enjoy various perks that make being a cardholder worthwhile. 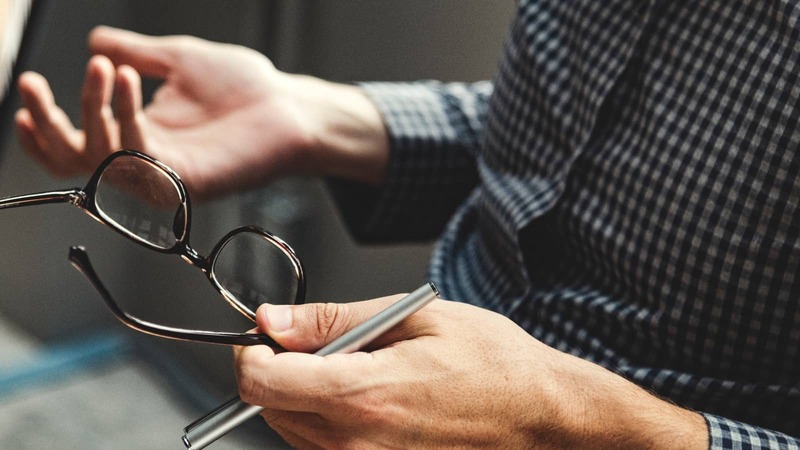 If you have been waiting to find the right card to use for your business, then you might want to take a deeper look at the available options. Many people choose to go with an airline-based rewards credit card due to the perks that it will offer. If you are willing to be loyal to one brand, then this can be a really good idea that will serve you well while traveling. One popular rewards credit card that people have been talking about is the Delta Reserve for Business Credit Card from American Express. This credit card is a great option for businesses that need to travel quite often. If you are already a loyal Delta customer, then using this card for your business may be a really great fit. Even so, it is smart to take the time to examine things deeper before making a commitment. Today we are going to take a look at everything the Delta Reserve for Business credit card from American Express has to offer. You can look at the rewards program, the key benefits, and all of the other pertinent details. 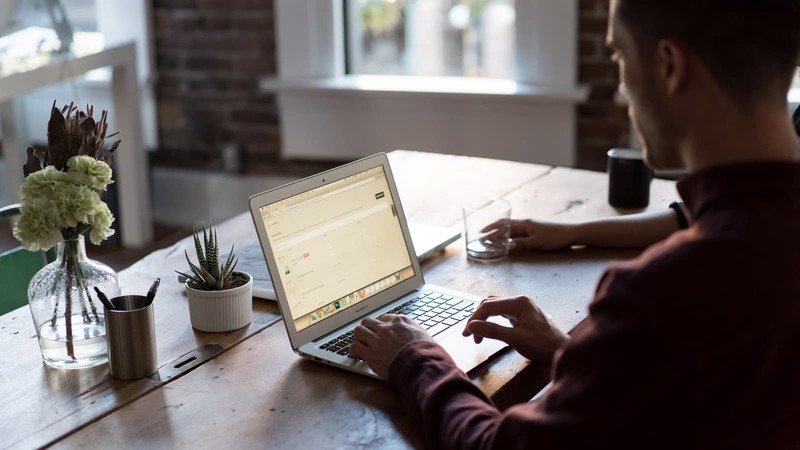 Once you know more about what to expect, it will be significantly easier to decide if it is right for your business. You’ll earn 40,000 miles after you spend $3,000 in the first 3 months. Also earn 10,000 Medallion Qualification Miles toward status. You’ll earn 2X miles on Delta purchases. Delta Sky Club access (plus up to 2 guests at $29 each). Annual companion certificate (good on domestic flights up to first class). Earn 15,000 reward miles and 15,000 MQM's after spending $30,000 in a calendar year. If you're after Delta MQM's this card can help. The fee seems too high for what it offers though. Other premium travel cards are superior. One thing to know right off of the bat is that this is a credit card with a rather high annual fee. The annual fee of $450 is going to scare away some businesses that do not know whether they will get their money’s worth out of this credit card. Truthfully, so long as you are going to be using this credit card often, you are going to come out ahead. The reason for the high price of the annual fee also has a lot to do with the perks that it offers. The features and benefits of this credit card will be discussed in more detail a little later on. One good thing about this credit card is that you will not be forced to pay any foreign transaction fees. Whenever you are traveling abroad, it is a real nuisance to be faced with fees just for using your card outside of the country. You can use this credit card to its full potential while traveling abroad and will never have to worry about being blindsided by fees. This is great for any businesses that have dealings in foreign countries. Most of the other fees are fairly standard for a business travel credit card. The balance transfer fee is set at 3% with a $5 minimum fee. The cash advance fee is also set at 3% with a $5 minimum fee. These are fees that you will be unlikely to encounter due to the card not really being set up as a balance transfer card. Most businesses will never have a need to take a cash advance from this card either but it is still important to be aware of the associated fees. Both late payments and returned payments will cost you up to $38 on this credit card. This is a very normal late and returned payment fee that will not make you bat an eye. You can see that the only really high fee that you will need to contend with is the annual fee. All of the other fees are well within normal ranges, making this a pretty practical credit card for many businesses. You will want to be aware of the welcome bonus that this credit card has to offer. The bonus that the card offers is likely to change over time but this card almost always has a bonus that will reward you with quite a few miles. To qualify for the welcome bonus, you will need to spend a certain amount of money during your first three months as a cardholder. Once you meet the qualifications, you will have bonus miles that you can use to help pay for some of your travel expenses. It helps to alleviate a little bit of that high annual fee. One very useful perk that you will take advantage of all the time is getting one free checked bag. You will receive one free checked bag on any eligible flight when you use this credit card. 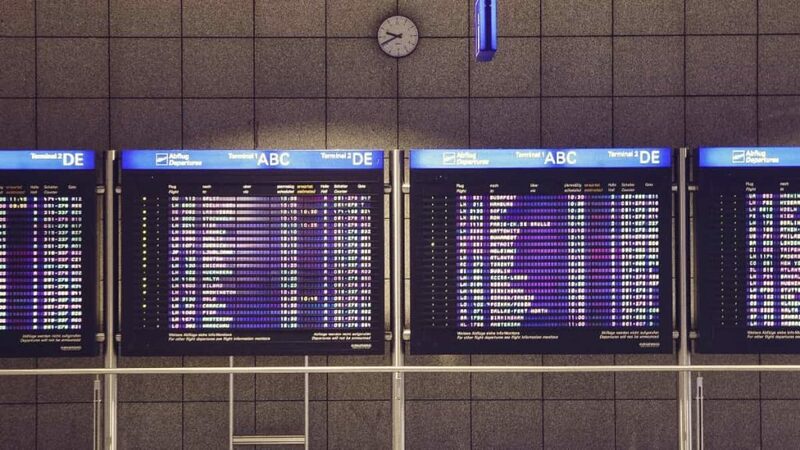 If you have multiple cards issued for your other employees, then the perk will allow them to get free checked bags as well when they fly with the main cardholder. 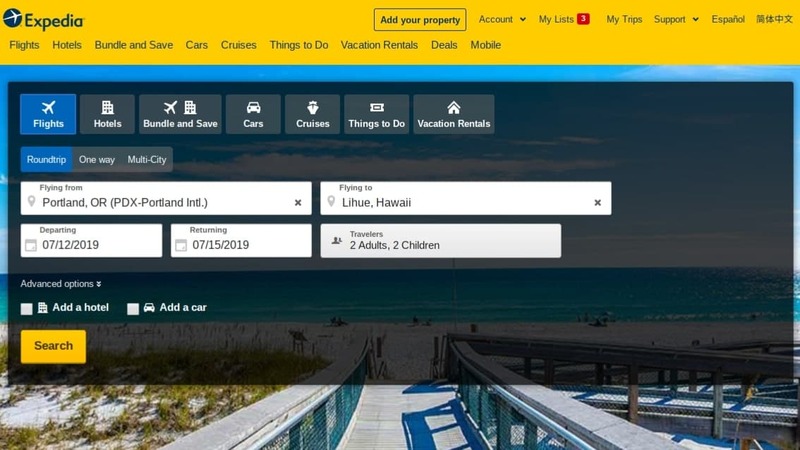 This can go a long way toward paying for the annual fee as you could save yourself around $50 per person on a round trip. Another extremely valuable perk is that you will receive an annual companion certificate. What this does is allow you to redeem the certificate to allow a companion to fly for free. This can give you a free round-trip flight to use on valid domestic flights in many different seat categories. It is possible to redeem this ticket for a first-class seat in many cases so the value of this perk is actually substantial if you use it right. Cardholders are also going to gain complimentary access to the Delta Sky Club lounges. Normally, it would cost you $59 to enjoy going into a Delta Sky Club lounge. If you are going to be traveling regularly enough on business, then this will be a fantastic perk. It makes your traveling that much more comfortable while also saving you a lot of money. You can also bring up to two guests with you and will only have to pay $29 per person to allow them to enter. It is also possible to receive 20% back in statement credit when you pay for things with your credit card while on your flight. Being able to save extra money on things such as in-flight drinks is a good little perk that many people will use. It mitigates quite a bit of your costs and makes it more practical to enjoy yourself during business flights. If you fly frequently enough, then you will surely be making use of this perk quite often. Another handy perk is that cardholders will be able to take advantage of Zone 1 priority boarding. This means that you will get to board your flight faster than normal so that you can get comfortable and find a good spot for your bags. This feature will also work for up to nine additional cardholders when they are traveling with the main cardholder. Perks such as this can truly make flying a lot more comfortable. You will also have the privilege of being able to access an around-the-clock concierge service. A good concierge service can make your travels much better. They can help you to book reservations at restaurants or to find tickets to a concert in town. 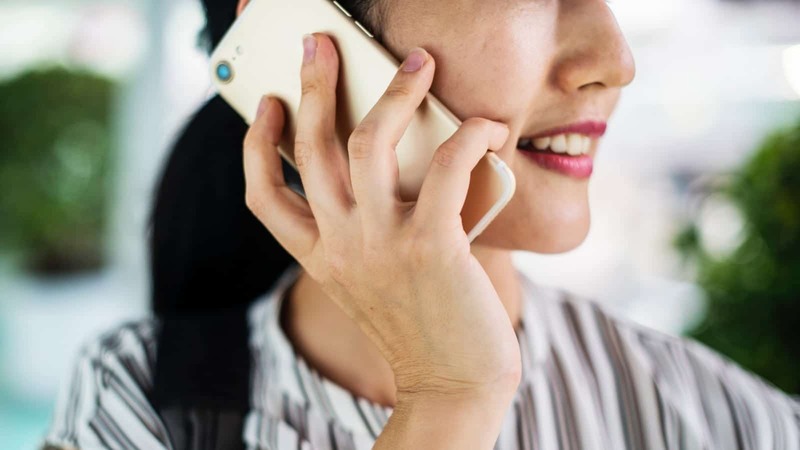 You will be able to get the concierge to help you with many particulars, making it a valuable perk that will pay dividends throughout the years. Of course, the rewards program is going to be a significant factor when considering whether this card is worth your time. You can actually earn some pretty good rewards when you use this credit card properly. You can earn two miles for every $1 that you spend on purchases directly from Delta. 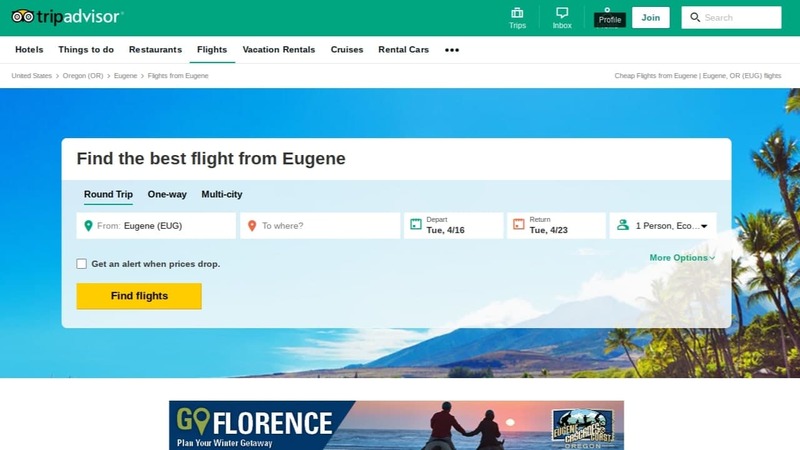 This means purchases such as airfare, seat upgrades, and in-flight purchases. Those who travel with Delta all the time will likely earn a large number of miles every single year. The normal rate for rewards outside of Delta purchases is not very impressive. You can earn 1X miles per $1 spent on all of your other eligible purchases. This makes it fairly impractical to use the card for purchases outside of the Delta family. You will not be using this card to buy groceries while expecting to be rewarded handsomely. 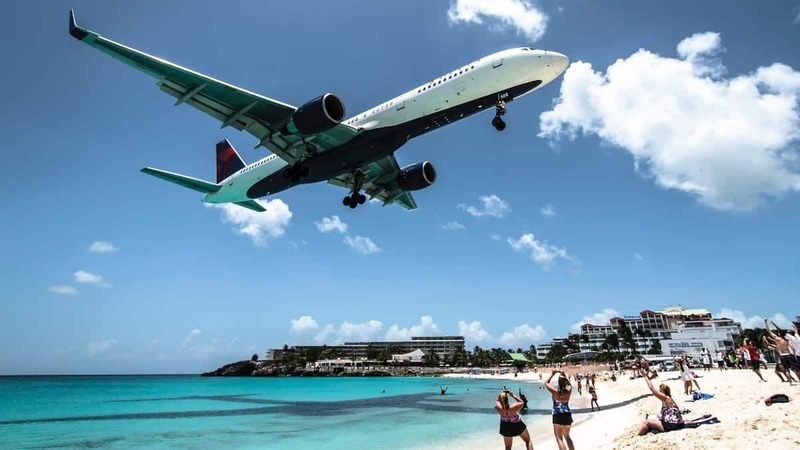 It is a pure travel credit card that has pretty good rewards if you fly with Delta on a regular basis. 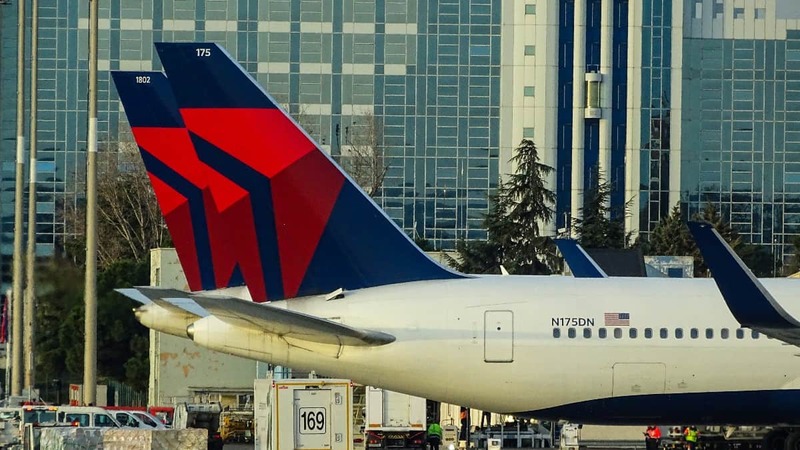 One extremely positive thing about this rewards program is that Delta SkyMiles do not expire. Some miles from other business credit cards may expire if you do not meet certain criteria. This may involve using the card every so often or redeeming the miles after a certain period of time. You do not need to worry about this when using the Delta Reserve for Business Credit Card from American Express. It is more practical to use your card when you do not need to worry about expiring miles. Redeeming your rewards is pretty straightforward with this credit card too. Your miles can be used to pay for airfare and seat upgrades with Delta. 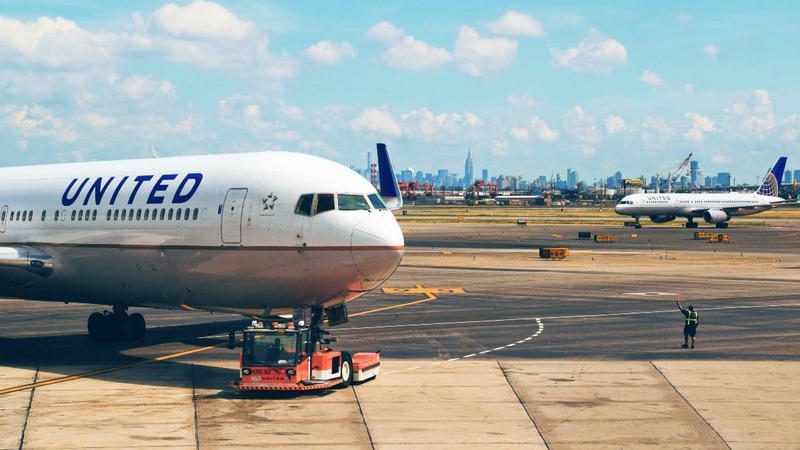 If you fly with Delta a lot, then you can make use of these miles to alleviate some of your expenses. 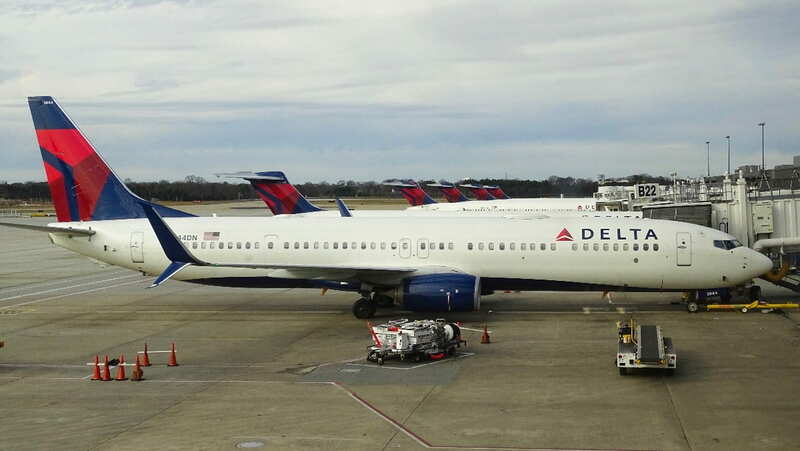 It will come in handy and the value of the Delta SkyMiles is generally pretty favorable. The value can vary a bit depending on certain factors but you should be able to enjoy a very easy and lucrative redemption experience. This credit card is going to be a perfect fit for any loyal Delta customers. If you already fly with Delta Airlines a lot, then you should definitely think about signing up for this credit card. You will be able to make the most of the benefits while also earning bonus miles. It can help to lessen some of your travel expenses over time while improving your travel experience. The benefits of this credit card are truly great overall too. 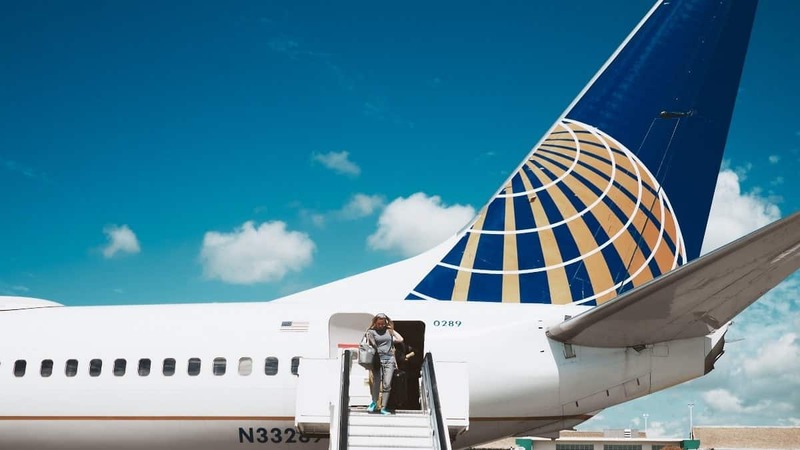 Being able to enjoy things such as a 24/7 concierge service, priority boarding, and the Delta Sky Club lounge access will improve your travel experience. You'll have a great time while traveling for business and it is going to make the annual fee completely worthwhile. You just have to be able to make the most of the perks. You won't have to pay any foreign transaction fees when using this card. 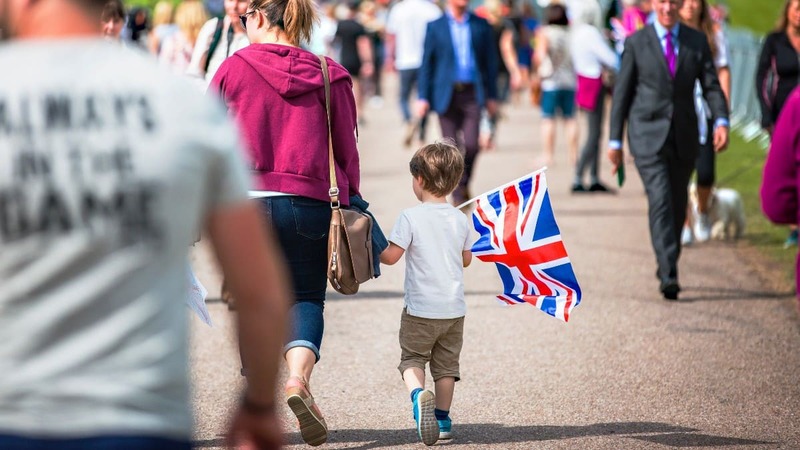 This is excellent news for businesses that have to travel abroad often. No one wants to pay fees any more than he or she has to. You can use this credit card outside of the country very easily so there is no reason to worry. Your earned miles on this credit card generally have a good redemption value too. 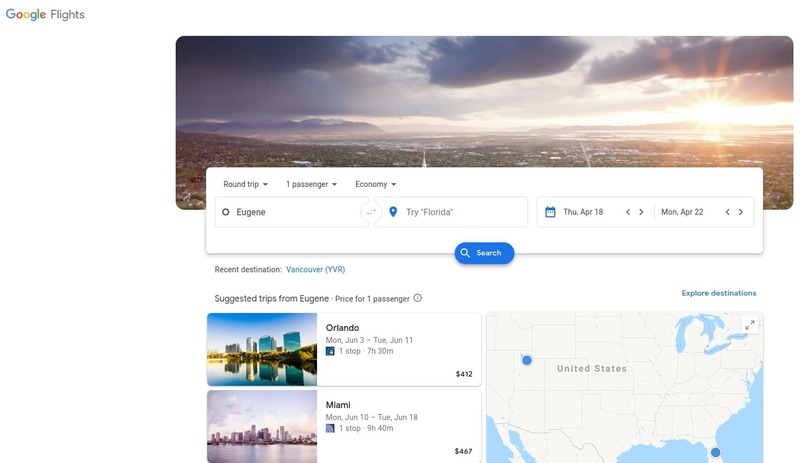 You will be able to redeem your miles to pay for Delta flights. The value of the miles can differ depending on the flight and other various circumstances. Even so, you can expect the miles to help you save a lot on your travel costs. The main factor that will deter some people from signing up for this credit card is the high annual fee. Any time that you see a card with an annual fee of $450, you have to take a step back to examine the details. This annual fee happens to be worth it if you are going to use the card often. It just depends on how much you travel and how often you will make use of the amazing perks of this card. It can also be said that the rewards program is a little underwhelming. The Delta Reserve for Business has the potential to be lucrative for those who fly with Delta Airlines all the time. The problem is that you do not earn many miles for things outside of direct purchases from Delta. It may be more practical for certain businesses to find another rewards card as the utilities of this card are a bit limited. In order to be approved for this credit card, you will need to have a very high credit score. This is going to necessitate excellent credit overall. If your credit score is not at least in the 700s, then you are highly unlikely to be approved for this card. With the high annual fee, it is a card that mostly appeals to businesses with regular travel expenses anyway. Check your credit score before you decide to apply for this one. Who Does the Delta Reserve Business Card Appeal to Most? A credit card such as this mostly appeals to businesses that are going to be traveling all the time. If you only travel every once in a while on business, then you will not really be able to take advantage of everything that this card has to offer. You want to be able to use the various perks that make the high annual fee worthwhile. That being said, it is also a decent rewards card if you can fly enough to earn miles with Delta. You will also need to be a regular Delta customer in order to make the most out of using the card. 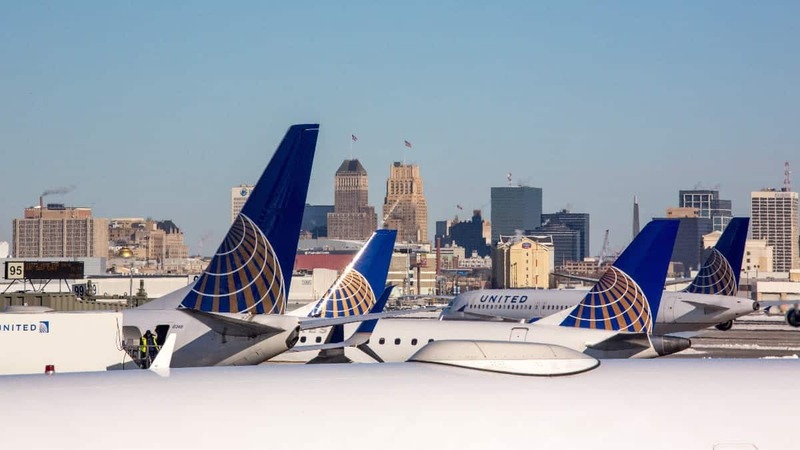 If you are not the type of business that likes to commit to flying exclusively with one airline, then you should probably look elsewhere. You need to be a Delta customer through and through if you want to sign up for this one. Think about whether you will be able to use this card often enough to make it worth your while. Those who are looking for a solid alternative business travel credit card may want to shy away from an airline-based credit card. You should think about instead, signing up for the Amex Business Platinum Card. It allows you to earn great rewards that can be used in various ways. 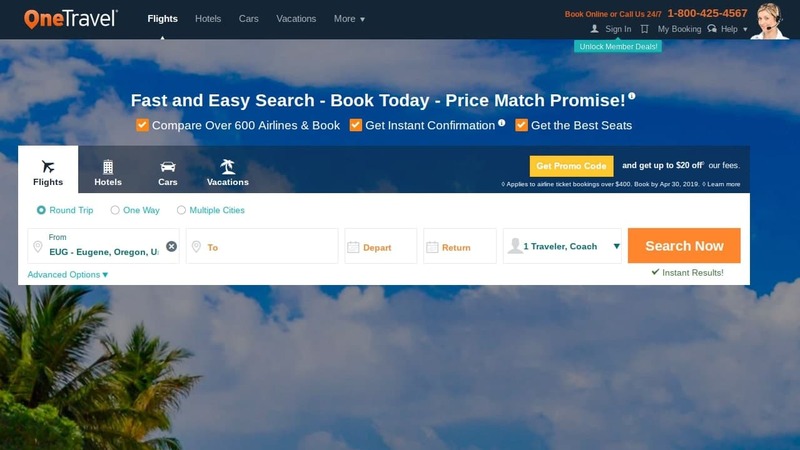 You can transfer your earned rewards to a number of different airlines or hotels, making the card a convenient option that does not limit you to just one airline. See our full review of the Amex Business Platinum Card. 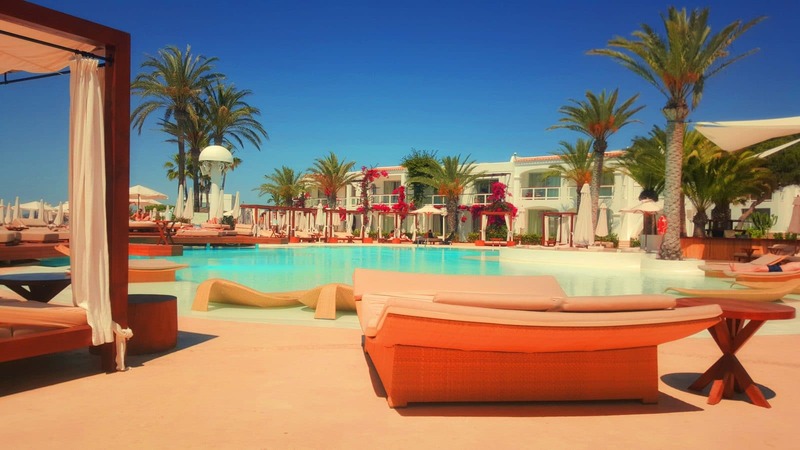 You will also gain access to many great perks at hotels and with airlines. You will gain more airport lounge access, discounts on first premium class travel, and other discounts for your business. For most business owners who travel often, the Amex Platinum Business is a much better option. Consider the benefits of each card and then decide which will give you the highest value. Decision Time: Is the Delta Reserve for Business Right for You? The Delta Reserve for Business Credit Card from American Express comes highly recommended for any business that can use the card properly. If you fly with Delta Airlines often enough, then this card is an absolutely sensible choice. It gives you access to a variety of different luxury perks that will improve your overall travel experience. Being able to enjoy things such as priority boarding, airport lounges, and a concierge service is perfect. It is not going to be the right fit for every type of business, though. Some businesses may be better off with a more general business travel credit card. Either way, this card has proven to be worth the annual fee for those who use it right. Consider signing up for this one if all of the perks and features sound good to you. Taking the time to find the perfect travel credit card is a good idea. If you like to travel, then you probably want to be able to earn rewards for doing so. If you have the right rewards card in your wallet, then you can benefit in several different ways. It is possible to earn rewards points for spending money in certain categories and these points can be used to help take care of some of your expenses. 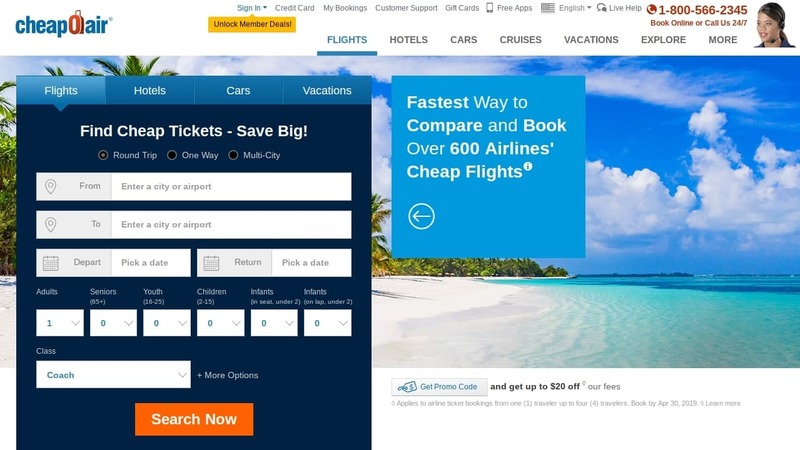 The problem is that the market is full of credit cards that offer travel rewards right now. It can actually be somewhat difficult to figure out which cards are going to be worthwhile and which ones are better off being ignored. Today we are going to be taking a look at the World of Hyatt Credit Card. This card has been gaining some traction as of late and many people have been very happy with the benefits that it has to offer. We are going to review this credit card thoroughly for you so that you can see what it brings to the table. 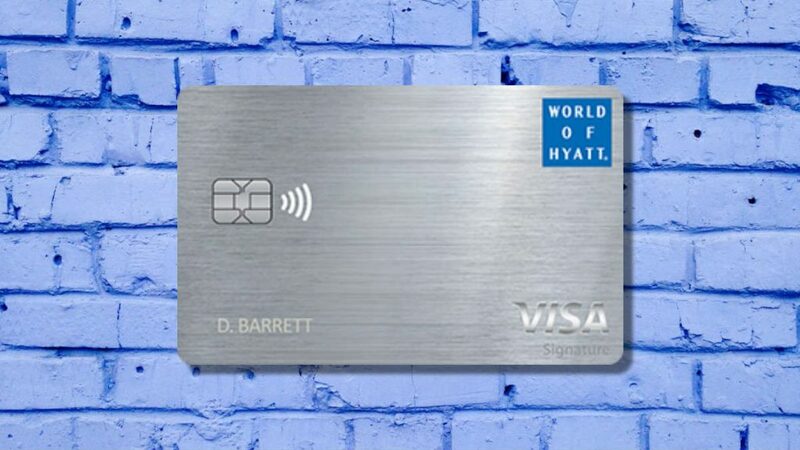 If you want a travel rewards credit card that will make your Hyatt stays much nicer, then this credit card just may fit the bill. Read on as we look at all of the particulars to see just how good this card really is. You will be able to learn everything that you need to know to make the best decision for your wallet. Earn up to 50,000 points. You'll earn 25,000 points after you spend $3,000 in the first 3 months and an additional 25,000 points after spending $6,000 in the first 6 months. You’ll earn 9X points per dollar spent at Hyatt hotels, and 2X points on restaurants, airline tickets, local transit, and fitness clubs. One free night award (up to category 4) every account anniversary. Another free night award when you spend $15,000 in a calendar year. 5 qualifying night credits each calendar year, plus 2 more bonus night credits each $5,000 in spend. The introductory offer is decent, but has a high spending limit to earn both tiers. If both tiers are met, it will earn you enough points for up to 10 free nights (category 1). The free night award each year for $95 is well worth it, if you can use it on an otherwise expensive night. The annual fee that is associated with this credit card is not too bad overall. You will need to pay $95.00 every year to keep this credit card in your wallet. This is not overly high so it is not going to scare away most people. If you want to gain access to a good rewards credit card, then you will find that fees such as this are commonplace. One negative aspect of this credit card is that the APR is somewhat high. If you are planning on carrying a balance on this credit card, then it may wind up turning into a somewhat negative experience. The best way to use this card is to ensure that you pay it off each month to avoid the negatives of the high APR. This may limit the usefulness of the card for some people, but it is pretty standard for many rewards credit cards to be used this way. On a positive note, this credit card does not have any foreign transaction fees. 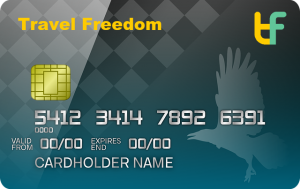 If you are planning on using this card while you are traveling abroad, then you will be able to do so without worries. Not having to worry about foreign transaction fees makes it more practical to use the credit card how you see fit. This will help you to be able to use the card outside of the country whenever it is going to be beneficial for you to do so. This card does offer a nice little introductory offer for those who want to make sure that they qualify. To earn the offer, you are going to need to spend enough money on purchases within the first three months of having the credit card. 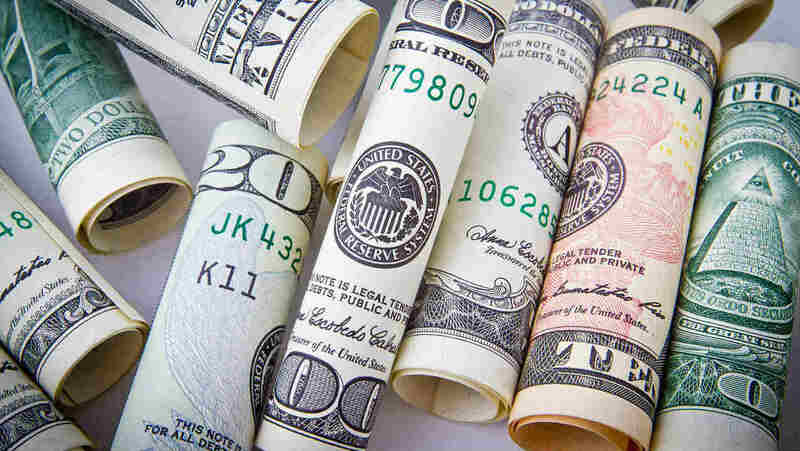 Once you meet the spending threshold, you will be able to receive a tidy sum of bonus points. Interestingly, there is also a second spending threshold at the six-month mark that will allow you to earn another set of bonus points. If you can take advantage of both, then it easily turns into a very lucrative offer. One of the best reasons to sign up for this credit card is due to the great benefits that it offers. Right away you should note that signing up for the credit card gives you automatic Discoverist elite status with Hyatt. This is going to help you to earn more bonus points than usual and it will also give you access to many useful perks. 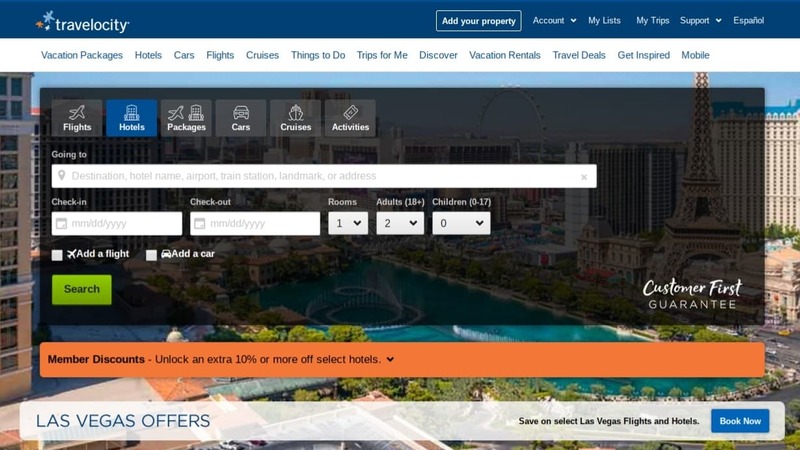 You will be able to enjoy things such as late checkout, priority check-ins, potential room upgrades, and more. This also puts you on the fast track toward earning the next elite tier status with Hyatt. You will receive five night credits that qualify toward your next tier status every single year. When you spend $5,000 on your card each year, you will also receive two more night credits that qualify toward your next tier status. This is perfect for customers who are loyal to the Hyatt brand and want to make the most of their experience. There are other standard perks that are quite helpful, too. For instance, you will be able to earn one free night for every card anniversary. This free night will be redeemable at up to category 4 Hyatt hotels or resorts, giving you plenty of redemption options. It is even possible to earn another free night for spending $15,000 in one calendar year. 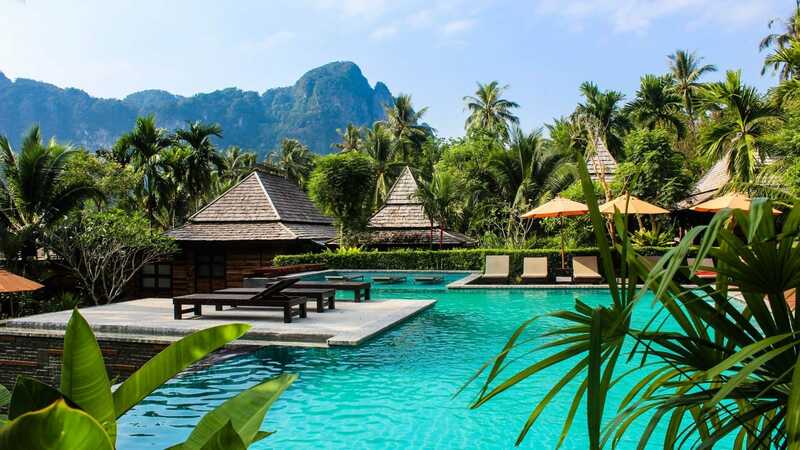 Being able to earn so many free nights will more than makeup for the annual fee of this credit card. Those who spend a lot of money on hotels or resorts will be able to meet the spending thresholds for free nights every year without fail. If you travel often enough, then this credit card is going to be particularly practical for you. 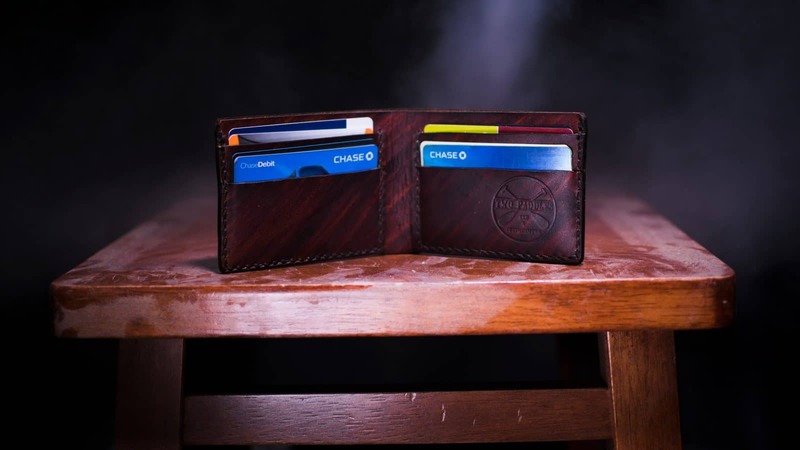 It has a lot of potential for the right type of cardholder. The rewards program of this credit card has a lot to offer as well. Your credit card is going to earn you 4X points for every $1.00 spent at Hyatt hotels. The effective rewards rate is actually going to be much higher than that, though. Due to being able to earn five base points from the Hyatt program per $1.00 spent, you will effectively be earning points at a 9X rate. This helps you to earn rewards very fast and the points are going to come in handy. You can also earn 2X rewards points per $1.00 spent on various other categories. It is possible to earn the 2X rate from dining purchases at restaurants, coffee shops, and cafes. 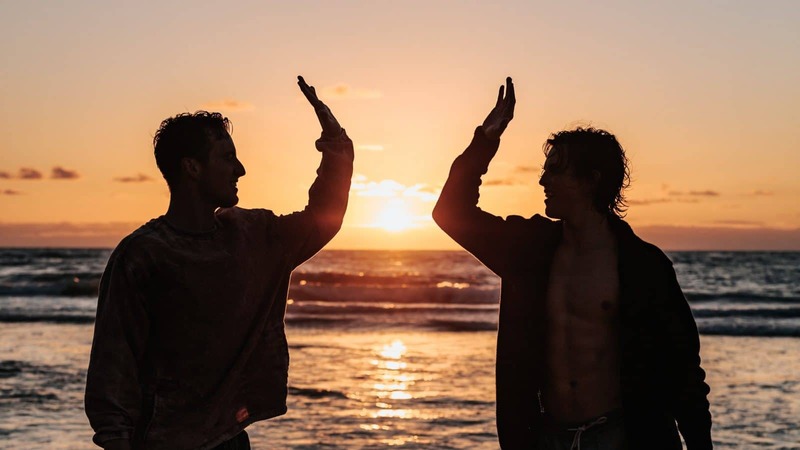 You will also earn this increased bonus points total for airline tickets purchased directly from an airline, ride-sharing services, local transportation services, gym memberships, and fitness clubs. It gives you many options for earning bonus points. All of your other purchases made with the credit card will simply earn you points at a 1X rate. The value of these Hyatt points is very good overall, making this a really solid rewards program. If you are able to use the card to its full potential, then you will likely have many points to use throughout the year. It can definitely alleviate some of your expenses while traveling if you use the card right. Redeeming your points is going to be pretty simple overall, too. You will be able to redeem your earned rewards points to pay for hotel stays and room upgrades. There are a large number of Hyatt hotels around the world, giving you many options for redeeming your rewards. Do note that Hyatt hotels are not located everywhere though, so they may not be in as many places as some of the most famous hotel brands around. Also, it is not going to be as lucrative for you to transfer your earned Hyatt points to their transfer partners. You can transfer your points to airlines to use them in the form of miles to pay for airfare. The problem is that the transfer rate is not stellar, meaning that you will lose out on a little bit of value if you decide to do this. It is good that the option is there, but it may not work out great for you if you like to maximize the value of your earned points. The good rewards potential of this credit card is what will make most people want to sign up. You will be able to earn a lot of points if you stay at Hyatt hotels often. Being able to earn the base points on top of the points you earn through your credit card is great. The points are going to add up fast and you will have many points to use to pay for your hotel stays and room upgrades. Being able to use your points to transfer to airline partners is good, too. This may not be the best value, but it is always better to have options. If you have earned so many Hyatt points that you cannot use them all for hotel stays, then it makes sense to transfer them to airline miles. There are several transfer partnerships available, so you might be able to use the miles with your preferred airline. Getting access to automatic elite status due to being a cardholder is a huge benefit as well. Simply being able to earn more points is a nice feature, but it also gives you access to good perks. 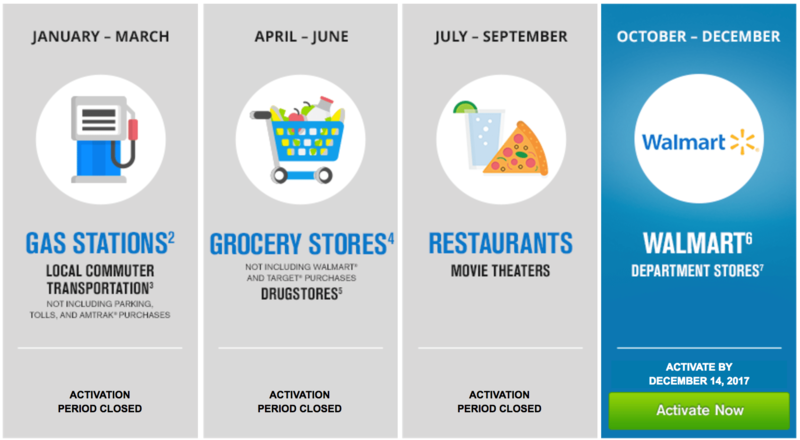 You will be able to enjoy late checkouts, express check-ins, and many other great benefits. If you like having the best possible experience at the Hyatt hotels and resorts, then this will really be appealing to you. You also will never have to worry about foreign transaction fees while you are traveling abroad. This makes it easier to use your card whenever it is necessary to do so. Most travel credit cards that are worthwhile will avoid foreign transaction fees. Even so, it is good to see that this card is customer friendly in that way. The poor transfer rate to the airline partners is honestly the most disappointing thing about this credit card. If the transfer rate was more favorable, then it would be much easier for this credit card to appeal to more people. As it stands, the card is still a good option, but it will be more limited in its appeal. You will mostly want to use the rewards to pay for stays and room upgrades at the Hyatt if you want to get the best value. It should also be noted that the rewards categories of this credit card are a bit complex. For instance, you cannot simply earn the bonus points for buying airfare in any way that you see fit. 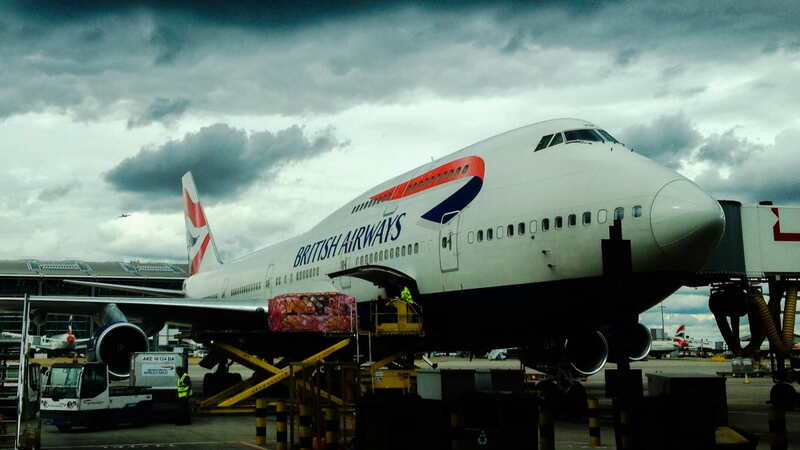 To earn the bonus points, you need to buy airfare directly from the airline itself. Things such as this are not overly complicated, but they can be a nuisance for those who want a more streamlined and simple experience. The high APR of this credit card is going to hold it back for some people as well. The APR makes it less practical to carry a balance on this card. If you want to be able to use this card easily, then it is best to pay it off every month. Some people will not like that the APR isn’t the best, so it may be a good idea to look for a comparable card with a more agreeable APR if this bothers you. Anyone who is interested in the World of Hyatt credit card will need to have a good credit score. If you want to be approved for this credit card, then it is best to have a credit score of 690 or higher. It is going to be easier to get approved when your credit score falls in the very good or excellent range. Taking the time to check your credit score first is highly recommended. Who Does the World of Hyatt Credit Card Appeal to Most? This credit card has the most appeal for people who like the Hyatt brand. 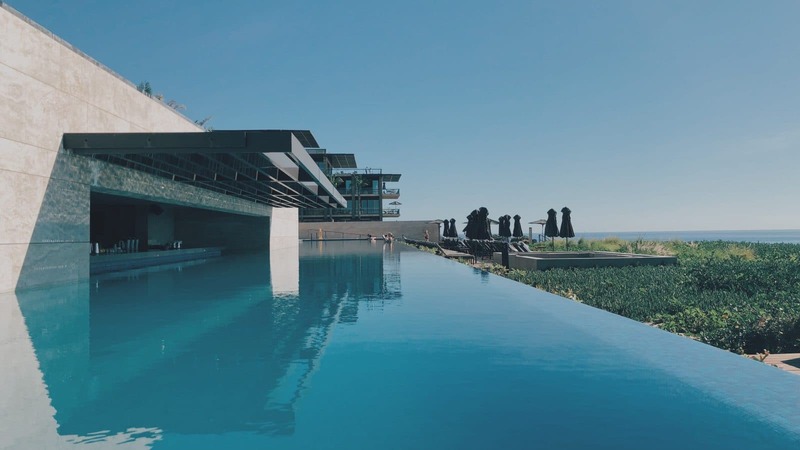 If you stay at properties that fall under the Hyatt umbrella multiple times per year, then you are more likely to have a good experience with this credit card. You will be able to enjoy the beneficial perks while also earning rewards at a good rate. Anyone who stays at the Hyatt properties all the time due to travel will definitely find this card to be worthwhile. The card is appealing for people who want to be granted automatic elite status as well. 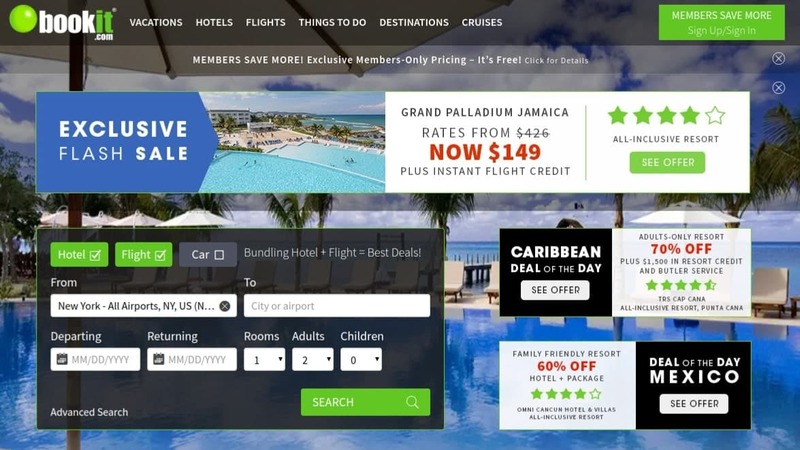 Simply having this elite status is going to give you increased bonus points, the potential for room upgrades, access to late checkouts, fast priority check-ins, and waived resort fees when redeeming your free nights. The potential of this elite status makes your Hyatt experience that much nicer. Anyone who uses these hotels often will benefit from this automatic elite status, so the card is worth considering purely based on that fact. 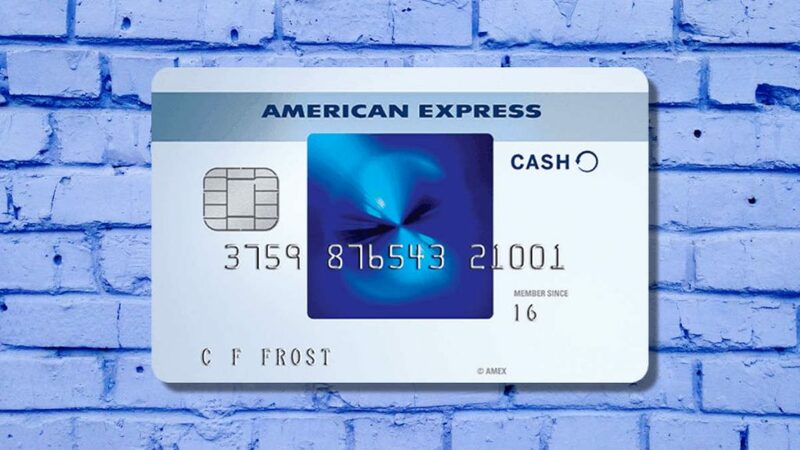 One of the best alternative credit cards to consider is the Chase Sapphire Preferred Card. If you want a credit card that is much more flexible than the World of Hyatt credit card, then you will be impressed by what it has to offer. 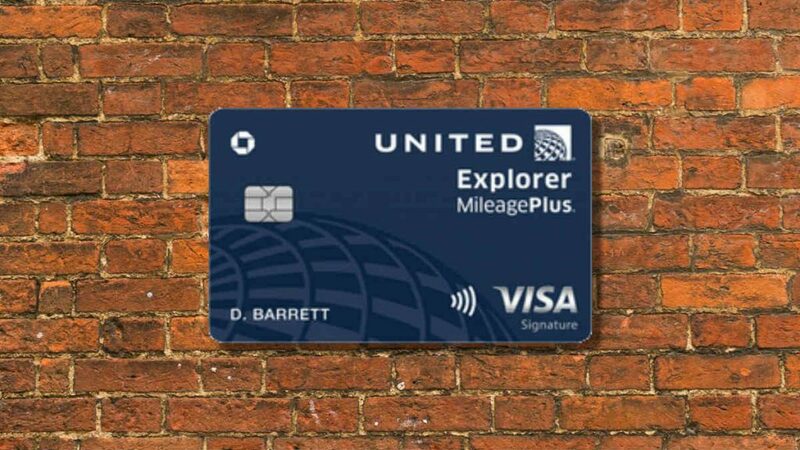 The Chase Sapphire Preferred Card allows you to earn unlimited 2X points per $1.00 spent on travel and dining. Everything else will earn you points at a 1X rate. 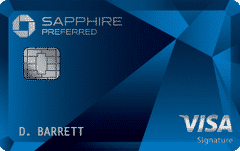 See our review of the Chase Sapphire Preferred card. This credit card is such a good option because of its flexible rewards redemption options. 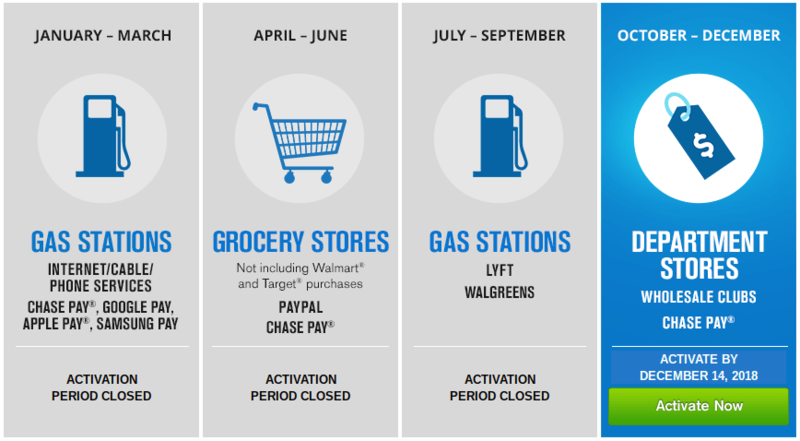 You will have access to the Chase Ultimate Rewards system and there are so many ways to use your points. Redeeming your earned rewards for travel through the Chase portal even has the potential to increase the value of your points by 25%. It makes it easy to pay for travel expenses while still giving you other options for redemption. Of course, you will not be receiving the same perks as you would with the World of Hyatt credit card. If you need access to the special perks that this card offers, then you might not find the Chase Sapphire Preferred Card to be a suitable alternative. It depends on your expectations and what you want out of a credit card. Keep both in mind and also consider what matters to you the most in a credit card. Decision Time: Is the World of Hyatt Credit Card Right for You? Overall, the World of Hyatt credit card is going to be a good option for many people. If you like to stay at hotels that fall under the Hyatt umbrella several times per year, then this is going to be a good card to keep around. You will be able to enjoy some nice perks while earning good rewards. 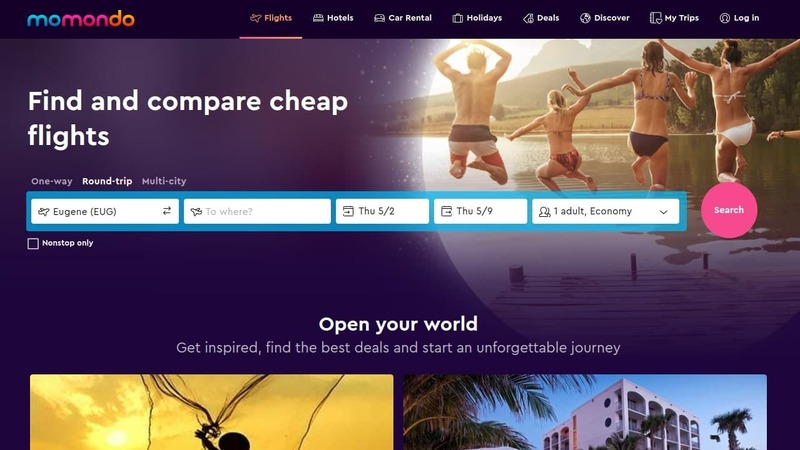 Just being able to get that free night annually is going to be enough to make many people want to sign up, as it is worth far more than the associated annual fee. Even so, this card is not the most flexible rewards credit card in the world. It is not without its flaws and some people will find it to be a bit limiting. It does not offer you the most robust experience when it comes to using your earned rewards points. If you want to have several options for how you use your earned points, then it is possible that you might walk away from this card a bit disappointed. So long as you have the right expectations, this credit card is going to do well for you. If you like the Hyatt brand and want to be able to enjoy the perks that come along with this card, then it is worth applying for this one. You just have to be able to use this card enough to make it feel like it is worthwhile. It is not going to be your everyday rewards credit card, so you will be using this one as more of a specialty card that you use when it is the most lucrative to do so.